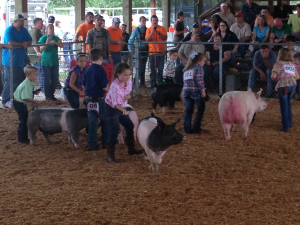 The Baker County Farm Bureau and Baker County FFA Alumni are proud sponsors of the Swine in the Pines Hog Show. This is an annual event that kicks off the fall fair season and prepares youth participants for show. More than 100 visitors from Florida and Georgia attend this tremendously successful event. Baker County Farm Bureau takes great interest in promoting agriculture through their youth. They are proud to be the lead sponsor in the Baker County Fair and Livestock Auction each October. The auction has grown tremendously in past years; in 2014 alone 54 hogs and 11 steers were auctioned off, raising more than $100,000.